Vivo is close to launching yet another mid-range smartphone, the Vivo Y17. We have now managed to get our hands on exclusive high-resolution images of the device, revealing all the color variants of the upcoming smartphone. 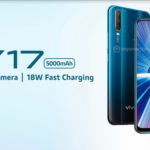 It appears that the Vivo Y17 will be launched in two color variants—Blue and Purple—and both of them will have a slight gradient color finish. The images that we’ve got our hands on also reveal some features and specifications of the Vivo Y17. The Vivo Y17 appears to have a glass-and-metal design, at least going by these images. However, it could very well be a plastic body with a glass front and a clear plastic rear. There appears to be a rear-mounted capacitive fingerprint reader. It is good to see that high-end features like a triple-camera setup are quickly trickling down from high-end phones to mid-range phones. There’s a 13MP+8MP+2MP AI triple-camera at the rear. At the front, there’s a bezel-less screen with a waterdrop-shaped notch at the top. 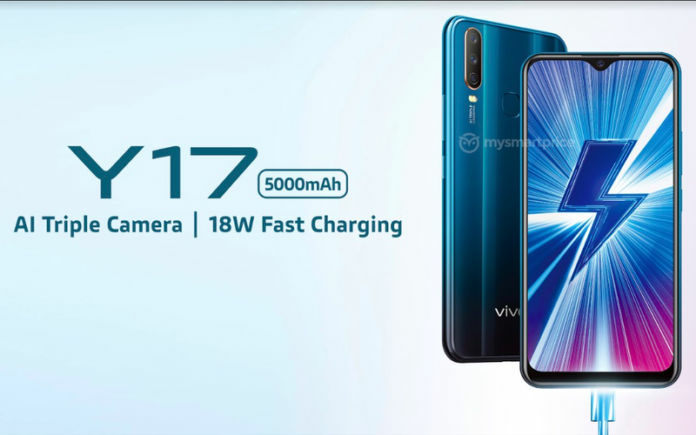 The last image also reveals that the Vivo Y17 will be powered by a 5000mAh battery which can be topped up rapidly by 18W fast charging. 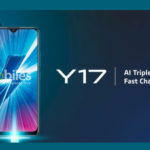 The rest of the Vivo Y17’s features were revealed in a separate leak, which reveals that the phone will come with a 6.35-inch IPS LCD screen that has HD+ resolution (1154×720 pixels) and a waterdrop-shaped notch. There will be a 20MP selfie camera inside the notch. 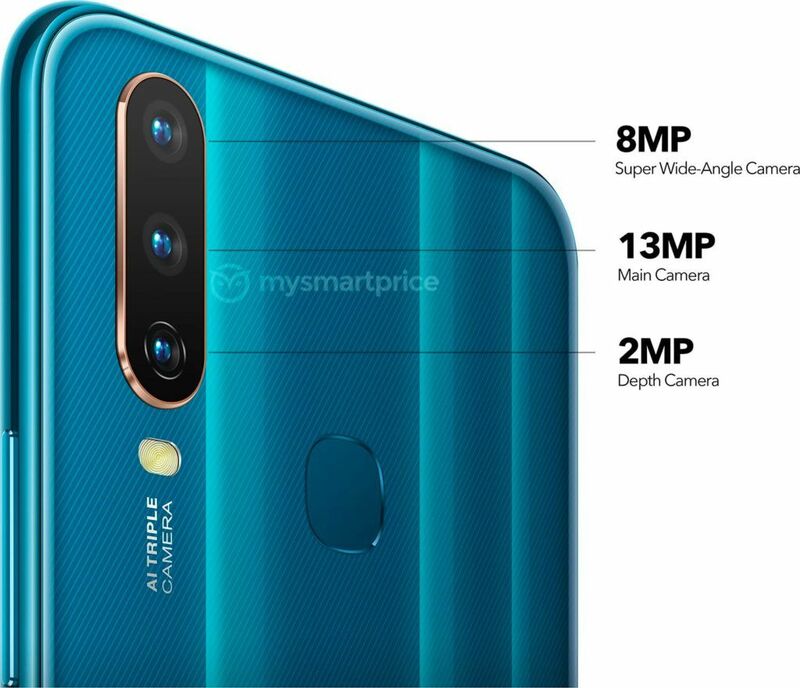 The rear-facing triple-camera setup will feature 13MP primary sensor, an 8MP ultra-wide angle camera, and a 2MP depth sensor. The phone measures 159.43×76.77×8.92mm and weigh 190.5g. The upcoming mid-range smartphone will be one of the first devices to be using the new MediaTek Helio P35 (MT6765) processor. The other phone using the Helio P35 processor is the Xiaomi Mi Play, which is only available in China right now. The MediaTek Helio P35 chipset is a 12nm chipset with four ARM Cortex-A53 CPU cores clocked at 2.3GHz, four ARM Cortex-A53 CPU cores clocked at 1.8GHz, and the PowerVR GE8320 GPU. The Vivo Y17 will feature 4GB RAM and 128GB internal storage. The phone runs Android 9 Pie-based Funtouch OS 9.0 software interface. The phone’s connectivity features include GPS, BeiDou, GLONASS, Galileo, FM radio, dual-SIM card slot, 4G LTE, Wi-Fi b/g/n, Bluetooth, and a microUSB port with OTG. The device will also come with all the required sensors. 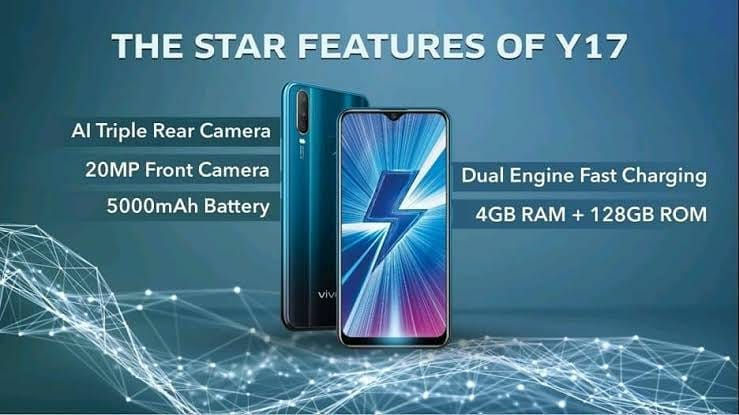 The Vivo V17 will also feature a 5000mAh battery, and it supports 18W Dual Engine fast charging.